Having a wall to wall carpet is nice, especially during the winter! There is nothing quite like the feeling of warm carpet under your feet! 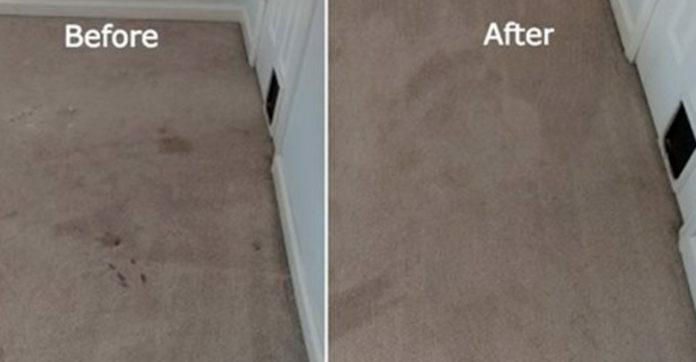 We all have those stubborn carpet stains that seem to resist cleaning. No matter what we try, those stains mock us and won’t come out! If you want your carpets professionally cleaned, it could cost you a lot of money! You could rent a carpet cleaner, but that could be a lot of work. There is a low cost, simple way to get those stubborn stains out and you probably have the materials you need in your cupboards right now! You need a hair dryer, one cup of hot water, and a teaspoon of dishwashing soap. Mix the soap and water and pour it on the stain. Watch the video to see how the iron and hair dryer are used! Now this was informative! Who’s trying this? Let us know how it goes and don’t forget to share away, people!